Shivaratri Celebrations in India are marked with devotion and religious fervor. Joy is writ large on the faces of millions of Lord Shiva devotees as they start preparing for the biggest Lord Shiva festival in advance. Celebrations of Shivaratri began with the break of the dawn on the Shivratri day and continue all though the night. Devotees observe fast and spend the day in devotion and worship of Lord Shiva. Many worshippers also participate in the jaagran or the night vigil organized in various Shiva temples across the country. Devotees believe that sincere observance of Shivaratri puja and all night worship of Lord Shiva will absolve them of all their sins and liberate them from the cycle of birth and death. Shivratri Festival is particularly awaited by Hindu women. On Shivaratri, married and unmarried women perform puja with great faith, as Goddess Parvati who is also called 'Gaura', is regarded as the giver of 'suhag' - good husbands, marital bliss and a long and prosperous married life. 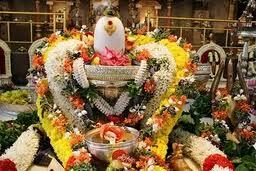 One can therefore see find women enthusiastically observing the fast and performing the rituals Shiva Pujas on the day.